Spring is just around the corner; so are you ready to kick off your boots and treat your feet to cute, comfortable gladiator wedges? Adam Tucker has the right gladiator wedge that’s ready to complement your everyday look. The Adam Tucker Tami is a new gladiator sandal that is both casual and dressy. Have you noticed gladiator sandals have become a big trend every spring and summer season? They continue to grow in popularity as they become more versatile and comfortable. 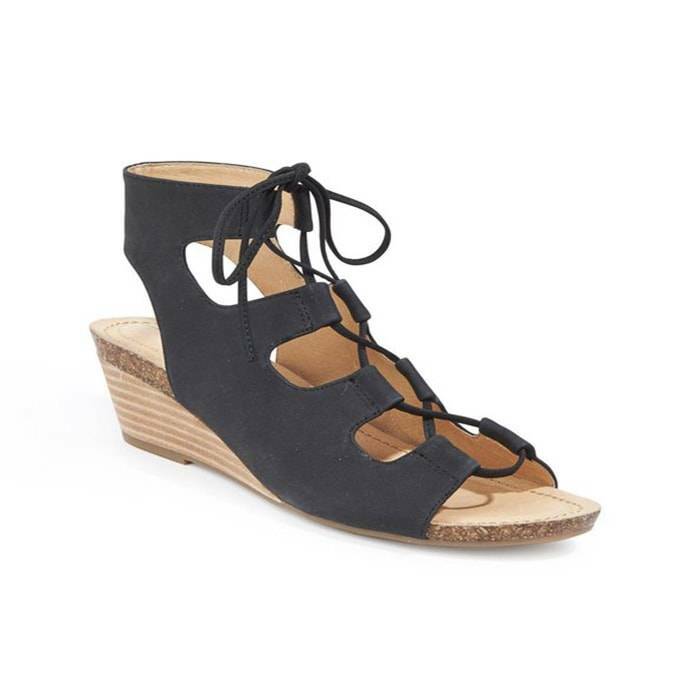 In fact, the Adam Tucker Tami is a trendy wedge that is both comfortable and versatile. You can wear this comfy gladiator sandal with a summer dress or with jeans. Gladiator sandals tend to look great from casual to elegant without breaking a sweat. Knowing how to wear gladiator sandals isn’t difficult. The simplest way to wear gladiator sandals is to pair them with your favorite pair of jeans or shorts, at the same time showing off your pretty pedicure. If you choose to wear your wedges out on the town, a simple black or dark colored gladiator can take a plain evening dress from formal to fabulous. A more sophisticated colorful gladiator sandal can add excitement to your Friday night outfit. Tami is a cute wedge that offers an elevated look while maintaining an excellent level of comfort. It’s a perfect gladiator sandal for women looking to stay comfortable without sacrificing style. How many times have you worn your wedges or heels and couldn’t bare the pain after a couple of hours? Knowing you would experience the dreaded pain, you still convinced yourself that your look was more important. You are not alone; many have placed excessive stress on their feet that could have been prevented with the right shoes. Stop hurting your feet with painful sandals and treat them to cute, comfortable wedges. Find a Lucky Feet Shoes store near you and let us help you find the most supportive sandals this season. Click here to find a store near you. Come into any one of our stores located in Anaheim Hills, Rancho Cucamonga, Riverside, San Dimas, Temecula, La Quinta and Palm Desert! Visit us today so you can try on a pair of Adam Tucker Comfortable Gladiator Wedges! At Lucky Feet Shoes, we carry many Adam Tucker shoes: sandals, heels, wedges, flats, booties and boots; in order to provide you with a large selection of comfort shoes. Come and visit us today! If you are looking for Comfortable Gladiator Wedges in Anaheim, Anaheim Hills, Yorba Linda, Brea, Orange, Placentia, Costa Mesa, Santa Ana, Fullerton, Irvine, Villa Park or Tustin; visit our store in Anaheim Hills for your footwear needs. If you are looking for Comfortable Gladiator Wedges in San Dimas, Glendora, Pomona, Covina, West Covina, La Verne, Azusa, Diamond Bar or Claremont; visit our store in San Dimas for your footwear needs. If you are looking forComfortable Gladiator Wedges in Rancho Cucamonga, Ontario, Upland, Fontana, Rialto, Chino, Chino Hills, Mira Loma, Eastvale, Colton or San Bernardino; visit our store in Rancho Cucamonga for your footwear needs. If you are looking for Comfortable Gladiator Wedges in Riverside, Moreno Valley, Corona, Rubidoux, Loma Linda, Grand Terrace, Redlands or Norco; visit our store in Riverside for your footwear needs. If you are looking for Comfortable Gladiator Wedges in the Temecula Valley, Murrieta, Fallbrook, Lake Elsinore, Wildomar, Hemet, San Jacinto, Pala, Sun City, Menifee, Canyon Lake, Perris, Bonsall or Anza; visit our store in Temecula for your footwear needs. If you are looking for Comfortable Gladiator Wedges in Indio, Coachella, Thermal, Vista Santa Rosa, Valerie; visit our store in La Quinta for your footwear needs. If you are looking for Comfortable Gladiator Wedges in Cathedral City, Thousand Palms, Palm Desert, Palm Springs, Desert Springs, Rancho Mirage or Bermuda Dunes; visit our store in Palm Desert for your footwear needs.